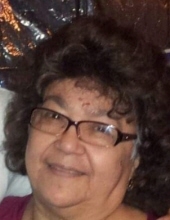 Guadalupe Franco Gomez, a 57 year long resident of Yuba City went to be with the Lord on November 11, 2018. She was born on September 23, 1938 in Tampico Tamaulipas, Mexico. She is survived by three daughters; Lupe Gonzales, Marta Gonzales and Yolanda Zuniga. Two sons; Hector Gomez and Juan Gomez. A brother Reymundo Franco. Three sisters; Concha Salazar, Juana Guizar and Maria Franco. 18 grandchildren and 36 great grandchildren. A celebration of life will be held at 6pm on the 28th of November 2018 at Lakeside Colonial Chapel. A inurnment service will be held at 11am on the 29th of November 2018 at Sutter Cemetery. She was preceded in death by her children; Elizabeth Mendoza and Rafael Gomez and parents Teresa and Juan Franco. To send flowers or a remembrance gift to the family of Guadalupe Franco Gomez, please visit our Tribute Store. "Email Address" would like to share the life celebration of Guadalupe Franco Gomez. Click on the "link" to go to share a favorite memory or leave a condolence message for the family.